James Bond 007, Lake Garda, "Quantum of Solace"
We had been planning a trip to Malcesine a couple of Wednesday's ago but the road along Lake Garda (named the "Gardesana") was closed as filming had begun for the new James Bond film, "Quantum of Solace". 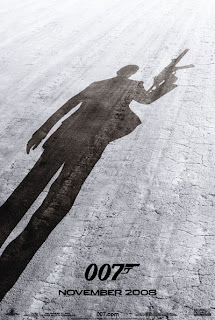 From April 14 to 24, several towns on Lake Garda (Gargnano, Tremosine, Limone sul Garda, Torbole, and Malcesine) were the film sets for the 22nd James Bond movie, "Quantum of Solace", directed by Marc Forster and Dan Bradley. So, when you go to the movies to see Quantum of Solace keep you eyes peeled for the Lake Garda scenes, the tunnels we share cars with, and the wonderful scenery. And, if you decide to come and ride here make sure you hook up with Eros Poli. This is a photo from a recent ride. And, the things I learned from this ride were: a) I should always carry my camera, b) you never know whom you are going to meet on a ride, c) well, it's just different here, d) all of the above. Photos above are from April 12th. Saturday, 12 April, I felt really good on the bike, as if I had reached another plateau of fitness. It didn't come by auto-magically, this cycle of KMs started innocently enough on Saturday, 29 March. On that Saturday in March I thought it would be nice to join Eros Poli's Saturday morning ride. Eros led out at a nice pace and took us to Cavion where were did a very nice, new, climb before descending into Bardolino. Eros was planning to wind his way back to Verona so at this point I suggested to Brent that we head north to Torre del Benaco. On the way we latched onto some wheels and arrived at Torre quickly. It was such a nice day we decided to continue further north for a visit to Malcesine. It was a beautiful early late morning in Malcesine so we wandered around the small streets and found a small piazza to have some pizza. It was such a nice day we decided to continue onto Torbole, at the north end of Lake Garda. Arriving there we decided to continue on....the climb to Nago, to Mori, finally turning south towards Peri and finally Verona. The trip south was hard with a really strong headwind. Fortunately (! ), I had a front wheel flat that gave us a few minutes of rest. We stopped in Peri for a panino to re-charge our batteries before continuing on to Verona. What started innocently enough had turned into a 170+ Km ride (105+ mile ride). That's the earliest in a year that I've done what we Americans call a "Century" ride. The next day, Sunday was a spinning, recovery ride, to Bardolino with some cruising on the back roads. Tuesday was busy with a trip to Dario Pegoretti but Wednesday it was back on the bike for the Gruppo 1 club ride (Damiano Cunego blew by us so fast going in the other direction that we didn't have a chance to yell, "Stoppppppp!!!"). 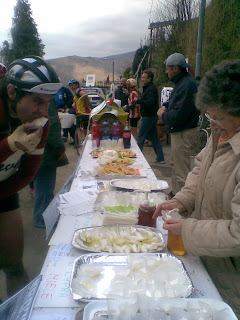 Thursday was the ride to climb from Peri to Fosse (see earlier blog entry), the earliest I've ever tackled that climb. The following week I managed to get in a few good rides. On Wednesday I was at the front of club ride when 3 guys motored by and it took me one second to recognize one of them as Rasmussen. So I closed the gap (let's be clear, they weren't going that fast) and rode alongside Rasmussen for about 10 minutes, chatting away with him while a Liquigas and another guy were doing the pulling . That was fun. The riding around here is amazing. Which brings me to 12 April. 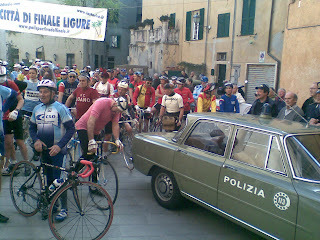 The Gruppo 1 club ride had scheduled a 160 km ride with a start time of 0800 from the club headquarters. Looking out my windows it didn't look promising, and the http://www.meteo.it/ forecast for where the ride was headed looked nasty. I decided to ride to our headquarters, perhaps there would be a change in the ride. As I crossed Ponte Nuovo in Verona it was sunny but you could see the dark clouds to the north. I rode through San Massimo with its beautiful church to arrive at HQ. Only 4 other brave souls had decided to get out of bed early. The long distance ride was cancelled so I volunteered to lead what turned out to be a 90 km ride under sunny skies. As long as we stayed south of the storm line we enjoyed what was a fantastic day, sunny and cool. My partners in crime were "I Hate to Climb" Renzo, "The Energizer and Tireless" Daniela, "I'd Rather be Riding My Motorcycle" Massimo, and "I'll Go Anywhere" Franco. I feeling was great on this day so I decided to climb Torre del Benaco to Albisano out of the saddle, all the way. It's at least a 5km climb but I did it rather easily but not so fast (I can't do both!). Three years ago I thought I was going to die going up when I first climbed it. 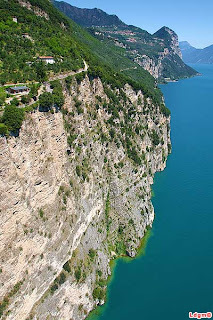 By the way, this is a great road for some nice views of Lake Garda. From Albisano we passed through Maciaga (Renzo was mumbling bad words under his breath at this point), and then it was some back roads into Verona. Great day. When we first arrived in Verona we absolutely didn't know anyone, including any bike riders. I quickly learned that on Sundays the "Lungadige" (Adige River frontage) road was closed on Sundays to vehicles and lots of clubs would meet there for their Sunday ride starts. The following Sunday I arrived too late for any of the club rides but I did meet Antonio. He was kind enough to tolerate my terrible Italian and gracious enough to show me the way to Lake Garda. Antonio is one of those typical "older" Italian guys that has been riding his entire life. He also happens to be very, very passionate about bicycles. Despite being about 65, in the last 4 or 5 months he has purchased 3 new Colnagos: a steel Master, the Ti model, and the carbon Extreme Power. He wanted to compare them. That's on top of the other bikes he already has. By the way, these "older" Italian guys that have been riding their entire lives never consider themselves "old", and no one else does either. "Old" here means someone in the 80s or 90s (I'll have to get a photo of Armando who is 95 riding his city bike). I've nicknamed Antonio "Cancer Man" because at every possible opportunity he has a cigarette. I know, it's crazy. He also rides without a helmet, also crazy. Thanks Antonio for my first ride in Italy and all the laughs. And, all the times you attacked me on Monte Grappa. "Bit worried when I saw the title but by the third photo realized the reason. Hectic!! 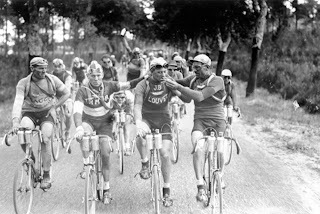 I've heard though that back in the day the big tour riders would also smoke because they believed it helped increase lung capacity?!?!?" Back in December I wrote here that Chesini would once again build some custom track/fixed gear frames until their availability of lugs and tubesets were exhausted. They received many inquiries and as time passed the project continued to evolve. In the end, the decision was made to focus on building a replica of the 1985 track bike that was built at the time to celebrate the 60th anniversary of Chesini. Two of the original inquirers proceeded with their orders and were recently sent their completed, made to measure, custom frames. While each customer took a slightly different approach to personalizing their builds, both of the results were outstanding. 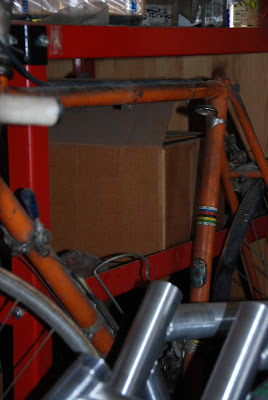 This Denmark bound track frame was pearl white, with a chromed rear triangle and all chrome fork. The lettering was in silver with black outlines. This USA bound frame was gloss black, chromed rear triangle, lugs, and fork (drilled for a brake) with a matching painted crown. First things first. Eros Poli and I are good friends. Eros, now in his post-professional cyclist phase of life, has been offering ride tours to Italians for several years. Now he is very interested in leading ride groups of American, European, Asian, and Australian cyclists. Eros' thinking about Italian cycling tours, and I agree with him, is that if people are coming to Italy to ride then the most authentic experience would be with someone that was not only born and raised in the region, but that also grew up riding and racing in the region. The fact that he's an ex-professional only adds to the authenticity of the experience, not to mention the fun stories about life in the peloton. Also, everyone seems to know Eros so doors open to places that you wouldn't find on any other tour. 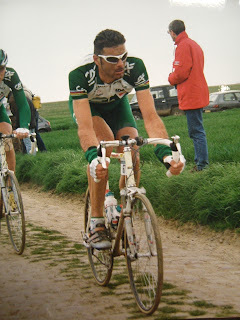 To re-cap his professional and amateur career: Eros raced professionally from 1991 to 2000 for the Del Tongo-MG, MG-Bianchi, Mercatone Uno-Saeco, Saeco, GAN and Credit Agricole teams. 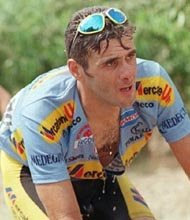 He was a founding member of the famous Mario Cipollini red train, and was also the lead out man for Frederic Moncassin. The highlight of his professional career was winning one of the most famous stages in the Tour de France: Mont Ventoux in 1994*. 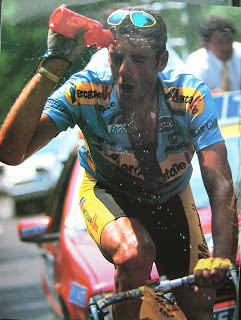 In the peloton he was highly respected for his honesty and fairness. 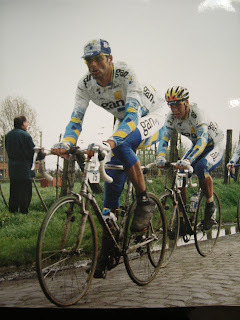 As an amateur, Eros' palmares include: Gold Medalist in the Men's Team Road Race, 1984 Olympics (Los Angeles, USA ); Gold Medalist in the 100 Km Team Time Trial, Road World Championship ( Villach, Austria ); and Italian National Champion in Pursuit. Hearing of all this might be intimidating but Eros is a terrific, laid back guy with exceptional people skills. Eros is also the Veneto representative to the Italian Cycling Federation, and that he's the only Italian that works for the Tour de France organization. Measures of how respected he is. Eros would be happy to work you in putting together a custom trip. Such trips could include a full week here in the Veneto near Verona and Lake Garda, or trips which might include Veneto riding plus the Stelvio, Gavia or Dolomites, and even combining a trip to the Briancon area of France to climb Galibier, Alpe d'Huez, and Izoard. He can also tailor trips to meet goals such as base training and climbing, or any specific areas you would like to ride in. And, he can recommend a range of accommodations from sports hotels to villas to suit your needs. *A native of Isola della Scala, Verona, Italy, Eros Poli is best remembered for his 1994 Tour de France stage 15 win of Mont Ventoux after a 106 mile solo escape. Eros, at 6 feet 4 inches and 187 pounds, was not a prospect to win one of the most difficult and famous climbs in the Tour de France. He escaped, however, from the peloton very early on and, under conditions of searing heat, arrived at the base of Mont Ventoux with a 22 minute lead. Steadily, the chase pack of climbers began taking back time. Arriving at the final 300 meters of the climb where the grade is 11% the lead had dwindled to 4 minutes. 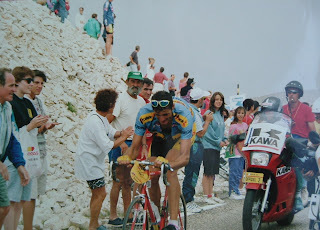 Eros survived Mont Ventoux and then hammered the descent to arrive in Carpentras to an incredible win by 3 minutes and 39 seconds ahead of Pantani and Virenque. His escape and victory earned him the nickname “Monsieur Mont Ventoux”. My good friend Eros Poli (Monsieur Mont Ventoux, so called because of his stage victory there in 1994) was invited to participate in the 1st edition of this new event, "La Storica", on April 6th. 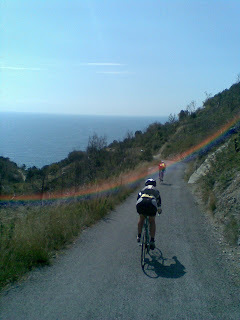 The 57 km ride begins and ends in Finale Ligure which is located on the Gulf of Genoa. 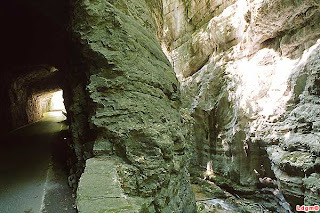 Parts of the route are on "strada sterrate" (non-paved) roads. The intent of the organizers is to re-create the glory of cycling of years long ago and all riders of vintage bikes were welcomed. 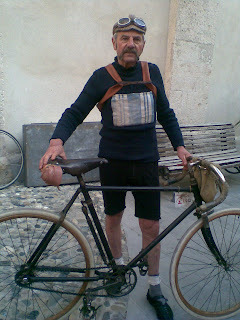 This ride would appear to be a Spring time alternative to the Fall "L'Eroica". 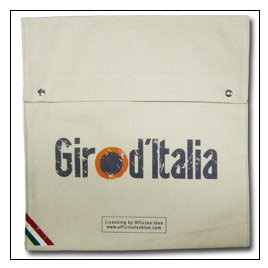 The marketing campaign for the 2008 Giro d'Italia has begun in earnest. 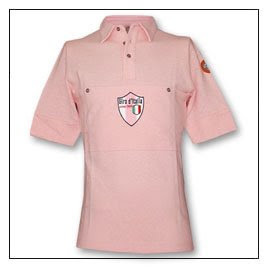 The leading piece in the campaign is this "The Giro returns, Italian passion" which appeared in yesterday's La Gazzetta dello Sport. I suggest trying info@tifoshop.com to inquire about ordering. As previously mentioned, Floridian Brent was spending a week in Verona to get some riding in. Five days of some long rides, mixed with some relatively short ones plus a visit to Dario Pegoretti, culminated with a plan to tackle the Peri to Fosse climb on Thursday. The Peri-Fosse climb is one of the "must do" climbs for all Verona area riders. 10% average for 10KM, with a couple of 15% sections. From Verona the best way to arrive at Peri is to wind along the Val Adige until you reach Peri. The weather along the way was lovely but Fosse had ominous cloud cover moving in. We arrived at Peri and Brent described the mountain as having been slashed by Zorro. There are only 10 switchbacks so the stretches are fairly long between the switchbacks making is look like Zs. As we climbed we were fortunate that it was still sunny on the climbing side of the mountain. In this photo you can see one of the switchbacks at the bottom, and across the valley the mighty Monte Baldo (which also has some great roads for climbing). On the valley floor you can see the town of Peri, and the Adige River. The 14th stage of this year's Giro di'Italia will descend from Fosse to Peri which I'm sure will be hair-raising. Brent beat me to the top but I made him turn around and go down a bit so I could take some photographs. I'm sure he was happy to do the 15% section again! We had a good panino at a coffee bar in Fosse and then continued on. After a small climb we came upon this spectacular view with Lake Garda in the distance. At this point of the ride it it was cold and windy. It's always a good idea to have available a jacket, and/or a good windbreaker, when riding in the higher elevations. From this point it was very long and very fast descent into Fumane. Before dropping down into Fumane we were treated to this view looking towards the Po Valley. Fumane welcomed us with sunshine. From here we motored back to Verona. We were tired from all the KMs of the week and just wanted to get back as quickly as possible. It's the crazy things that do you that you best remember, right? Brent dropped in for a visit again so we planned to ride to Dario Pegoretti's (Dario was also winner of the "Framebuilder of the Year" award) workshop in Caldonazzo on Tuesday. However, we did a lot of riding over the weekend (220 km +) so we decided to take the train from Verona to Caldonazzo instead as it's a 200km bike ride with some climbing thrown in. Caldonazzo is very easy to reach by train via Trento or Bassano del Grappa. This would also enable us to spend more time with Dario. The Trento to Caldonazzo train was ultra-modern with clever bike racks; it obvious that being an autonomous region has its fiscal advantages. 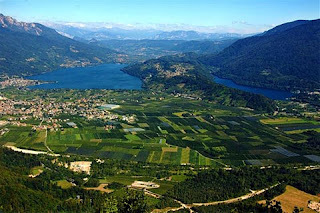 The village of Caldonazzo is located on the shores of Lake Caldonazzo in the autonomous region of Trentino-Alto Adige. It's a beautiful setting as can be seen from this aerial photograph showing the village on the upper left. 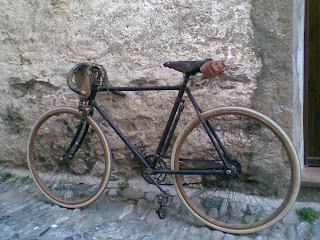 It's a very old MASI, a "Speciale" model when they still used the Italian for Special (which came later). 1960s? We chatted with Dario, in Italian and English, for quite awhile. A nice lunch gave us the opportunity to solve all the problems of Italy (just kidding) and talk about bike building, and the long history of builders from Verona. Brent was able to discuss some ideas he had with Dario about a future order to be placed with GITA. The workshop is very busy, orders are up. There have been some delays in getting all the Columbus tubesets Dario would like. The main thing is that Dario is looking and doing well, and he continues coming to Verona for monthly checks with his doctors. 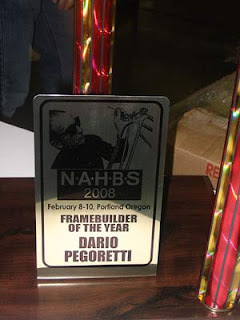 Someday I'll be asking myself why I haven't purchased a Pegoretti while I'm here. The answer, in part, is because the dollar is at 1.58 to 1 Euro at the moment and I'm retired. As they say here, "Boh." The train to Trento offered these last views of Lake Caldonazzo, and of Trento. If you are ever in the Veneto, Trentino or Alto Adige you should plan to visit Pegoretti. It's a "must see". Email or call in advance.